A single Rashford goal in the thirty-fourth minute wins it, in a relatively low-key game. 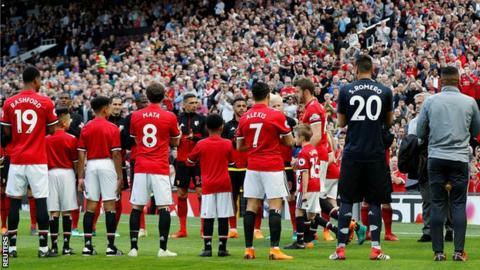 Before the game, Carrick was given a guard of honour by both sides, as he was playing his last game for Manchester United. He walked out to the pitch, hand-in-hand with his children. A truly emotional day for him, and everyone who loves the club. Myself included. Congratulations to Carrick, for playing a total of 464 games for Manchester United. Carrick played a part in the only goal of the game in the thirty-fourth minute, as he hit the ball over the top for Mata. Who then squared the ball for Rashford, who then scored. In the other highlight, of a relatively quiet first half, fell to Watford. Richarlison headed the ball right at Romero from close range. With the Manchester United number two, making a fantastic save to deny the Brazilian. Mata was the best player of the second half. He was a constant threat. Every time he had the ball, he was looking to make things happen. Pressuring Watford with his creative play. Brilliant passing from the Spaniard at times. Showing his quality. The same can be said for Rashford, who was a threat. Using his pace to trouble the Watford defence. But overall, the game lacked energy for the most part. Martial playing a part would have done a world of good. But he wasn’t even on the bench. Despite being predicted to start before the game. Reports say it was down to an injury. But I’m not convinced. As my followers on Twitter know, i’m convinced Mourinho is trying to force Martial out, by purposely messing around with his game time. Only time will tell us the truth, regarding the real reason for his absence against Watford. Carrick left to a well deserved standing ovation in the eighty-fifth minute, when he made way for Pogba. Many Manchester United players, and even Mourinho himself, embraced the former England midfielder. It was a touching moment, to say the least. Manchester United ended the game with eighty-one points, which is their highest end-of-season points tally since Sir Alex retired back in 2013. Just like Manchester United’s game against West Ham on Thursday, it wasn’t the most free-flowing game. But Manchester United did get the three points, and that’s the most important thing. You have to think that Mourinho now knows who will start against Chelsea, in this coming Saturday’s F.A Cup final. And in the bigger picture, who will be wearing a Manchester United shirt next season. An overall pleasing display against Watford. The basics were done well. And every player played their part. A difficult task awaits Mourinho during the summer. Who will he keep? Who will he sell? He has a lot of decisions to make. I’m sure he has already made a few of those choices already. Unfortunately, he seems to have already made up his mind about Martial. But everyone else has an agonising wait to find out their fate. But the F.A Cup final against Chelsea, will be some players last game for the club. We will find out everyone’s fate soon.